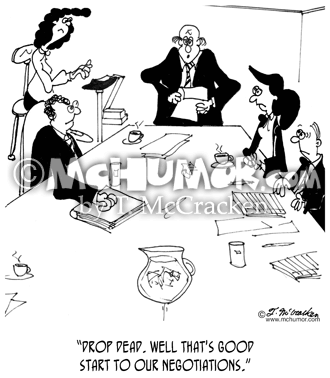 Arbitration Cartoon 7128: At a conference table a man saying, "Drop dead. Well that's good start to our negotiations." 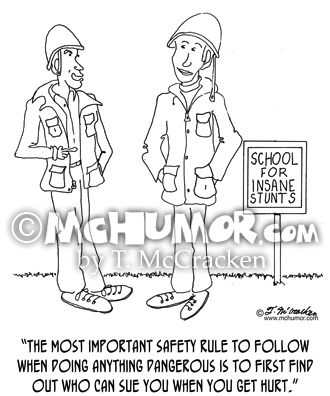 Extreme Sports Cartoon 0414: A man in a helmet at the “School For Insane Stunts” says another, "The most important safety rule to follow when doing anything dangerous is to first find out who can sue you when you get hurt." 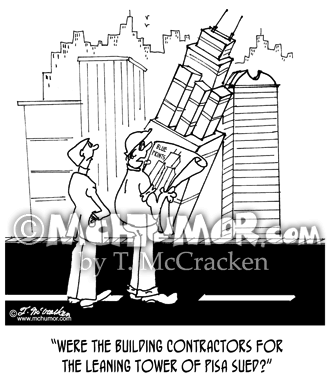 Contractor Cartoon 4815: Of a leaning office building a contractor asks, "Were the building contractors for the Leaning Tower of Pisa sued?" 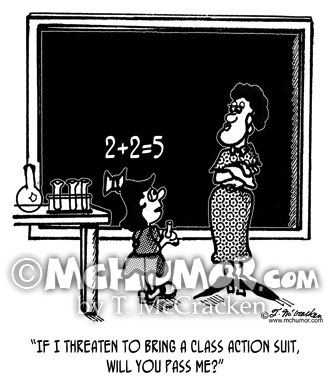 Lawsuit Cartoon 3006: A little kid who's written "2+2=5" on a blackboard asks her teacher, "If I threaten to bring a class action suit, will you pass me?" 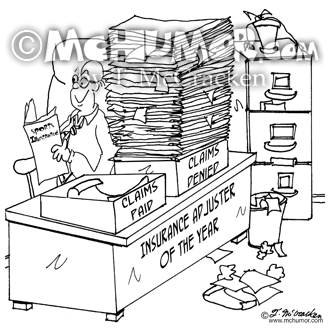 Insurance Cartoon 8378: The “Adjuster of the Year” reads a Sports Illustrated at his desk that has two boxes, “Claims Denied” and “Claims Paid.” The first has an over flowing stack of paper in it, the other a single sheet of paper. 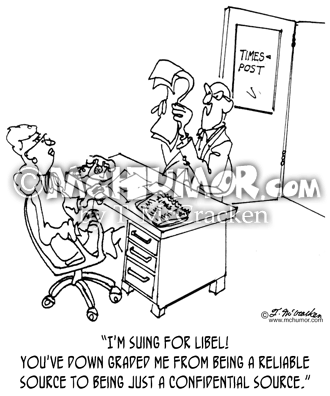 Liability Cartoon 3012: A medic with lots of papers says to a wounded soldier, "... Now this releases me from any liability. 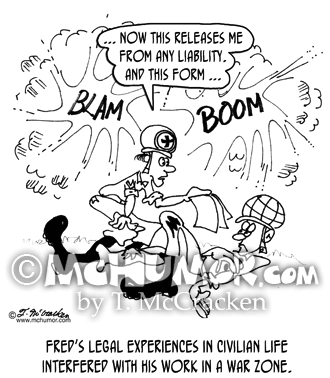 And this form ..." "Fred's legal experiences in civilian life interfered with his work in a war zone." 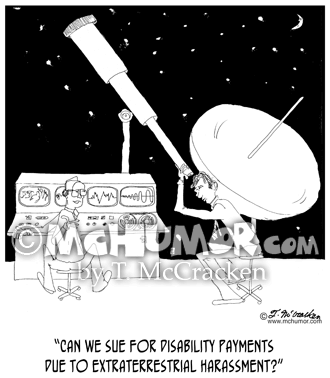 Astronomer Cartoon 4612: An astronomer says to another, "Can we sue for disability payments due to extraterrestrial harassment?" 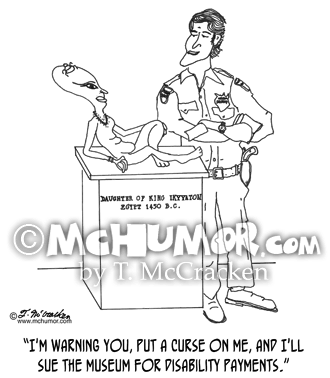 Disability Cartoon 0211: A museum guard says to a weird Egyptian statue, "I'm warning you, put a curse on me, and I'll sue the museum for disability payments." 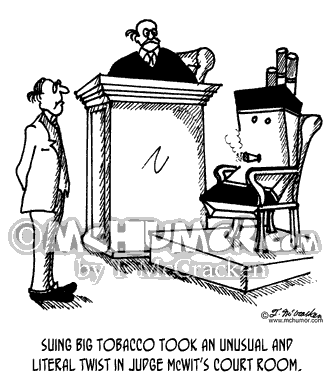 Cigarette Cartoon 3496: "Suing Big Tobacco took an unusual and literal twist in Judge McWit's courtroom." On the witness stand is a six-foot tall pack of cigarettes.